You know what? 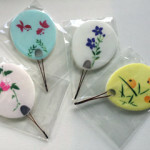 There are many souvenir products which are available only in those regions of Japan. They are sold at each local airport, station, service area on highways, and stands at sightseeing spots. 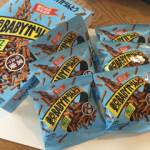 “Giant Pretz(ジャイアントプリッツ)” is a big pretzel-like stick which is approximately 21cm (8.5 inch) long. On the other hand, “Tiny Pretz（ちっちゃなプリッツ）” is 2.2 cm(0.86 inch) long, and it is the shortest in the history of Pretz, so you can enjoy nibbling on these Japanese sweets or snacks little by little. 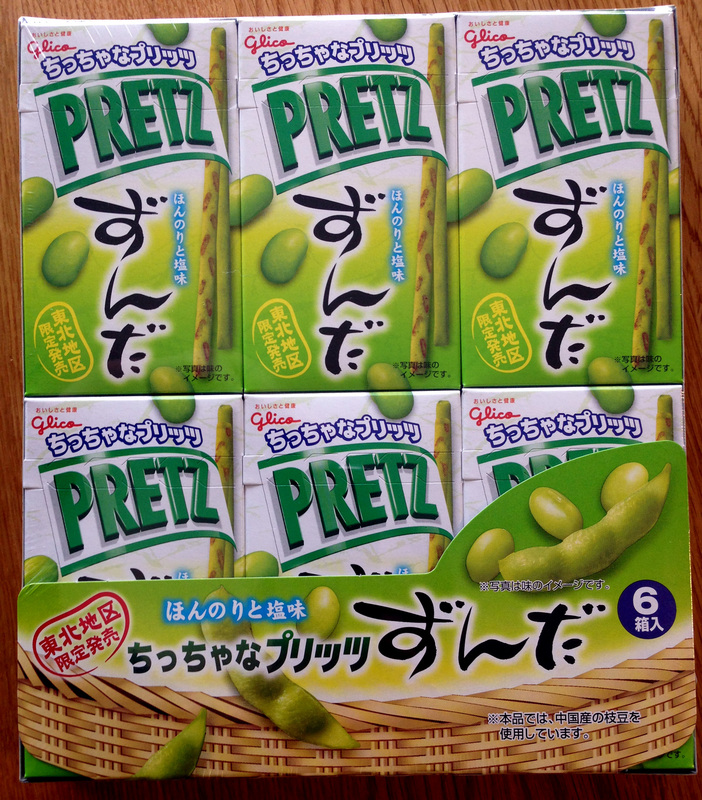 I ‘d like to introduce to you Glico’s snacks’ Pretz in the local souvenir ranking. 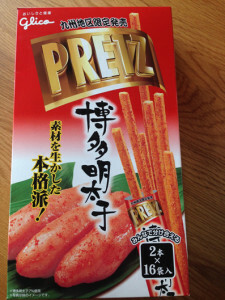 It is a kind of Pretz with a spicy caviar taste, which is the specialty of Fukuoka prefecture. The Hakata Mentaiko is one of the most famous and popular souvenirs among tourists visiting the Kyushu district. 10% of the weight of the dough contains Mentaiko caviar from Fukuoka prefecture. This Pretz is coated with salty and spicy flavoring.You can enjoy two different tastes at once, the Metaiko’s fresh Umami taste like a luxurious caviar, and spicy red pepper flavor. Do not be afraid to try this spicy caviar taste even if you do not like to eat cod roe.This Pretz does not smell or taste fish, it is only a delicious spicy flavor. It has a simple taste of green soybeans which is the specialty of Miyagi prefecture. Zunda is a sweet green paste made from young soybeans in the pod, and it is used for coating local dishes in the Tohoku region. 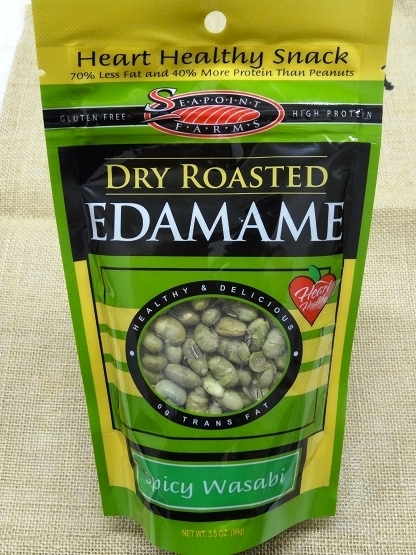 The flavor is crunchy and crispy on the palate, while leaving a lingering flavor originated from soybeans. 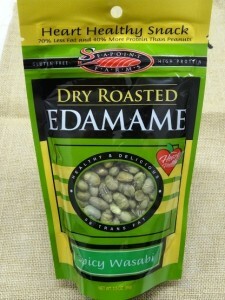 Do you know the ‘American snack Seapoint Farms Edamame (Green soybean) Spicy Wasabi’? 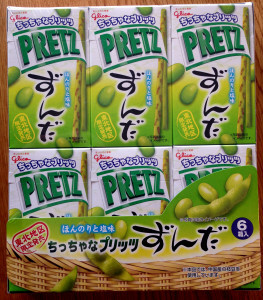 I think that probably most foreigner’s, when they see the Japanese Pretz Green soybean for the first time, recall this snack. 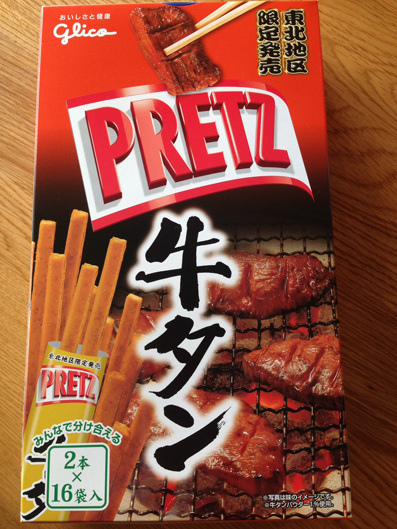 This Pretz’s umami is more complicated and deep tasting than general soybean snacks. The slightly salty and sour soybean taste harmonize with flavorful sweetness. One box contains 6 small boxes, so it is perfect to give as a souvenir. It is a kind of Pretz with a strong beef taste, which is the specialty of Sendai prefecture.This Sendai beef is really good, and is one of the most famous and high quality beefs in Japan.The roasted beef umami is kneaded into dough and is also dusted on the baked surface of the Pretz, so you can enjoy the umami saltiness and “rich meat flavor” sauce. 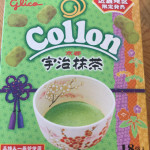 If you want to eat a snack which perks you up, but you can not to eat a whole meat steak, then let’s try this salty meat flavor. 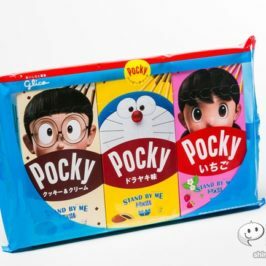 The Pretz is designed so that you can easily spread “Ogura An (sweet red bean paste)” on it, and it is butter-flavored so that you can enjoy the flavor more. 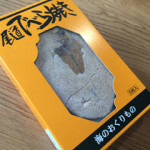 Let me explain a little more about Nagoya Ogura toast. It is a well-known local dish and popular amongst Nagoya people. 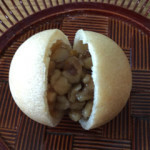 It is thickly-sliced, toasted bread topped with a spread of margarine or butter and sweet red bean paste.You could say that the red bean paste is like a jam or jelly. 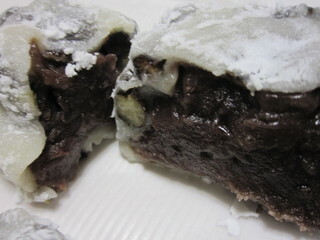 In addition, you can find a Pretz with famous red bean paste from Hokkaido, too. Mainland Japanese love ingredients from Hokkaido. One box contains 6 small boxes, so it is perfect to give as a souvenir. 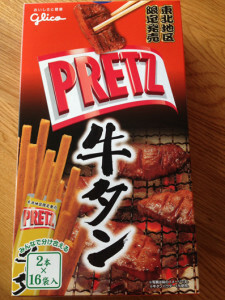 It is a kind of Pretz with a Hiroshima okomomiyaki taste, which is the specialty of Hiroshima prefecture. Did you know that Okonomiyaki is one of the most popular home cooked dishes in Japan? So,how do we make an okanomiyaki? Okonomiyaki is usually cooked on a hot iron plate in the center of the table or in a frypan at home. It is made of flour mixed with some water and minced cabbage as batter, and thinly sliced pork, seafood, and other vegetables like spinach are placed on top. This dish is a suitable for children, because it has a lot of nutrition, it is quick to make and has a simple taste. 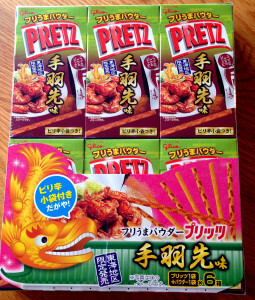 In addition this Pretz uses real cabbage powder in the sauce named “otafuku”, it is added to Pretz to bring a genuine taste of Hiroshima to it. Just a bite of this Pretz will give you an idea of what the real taste of Hiroshimayaki is like. If you want to make okonomiyaki yourself, please check the back of Pretz’s packaging on which is printed a recipe for Hiroshimayaki. One box contains 6 small boxes, so it is perfect to give as a souvenir. No1: It is the best snack to nibble with drinks.The salty and spicy caviar taste is luxurious and delicious. The coating of salty and spicy flavoring leaves a nice after taste in your mouth. 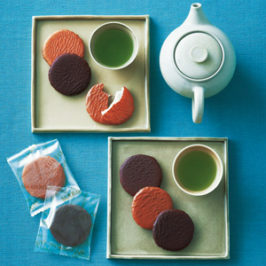 No2 : Lingering flavor originated from sweet paste of soybeans. You can enjoy the local specality taste of the Tohoku region. No3: “Beef taste” is delicious, (for many people Japanese beef is expensive, so rarely eaten). No4 : The flavor of “Ogura toast” is satisfying. No5 Okonomiyaki and Takoyaki are two of the most popular dishes among Japanese, especially woman. 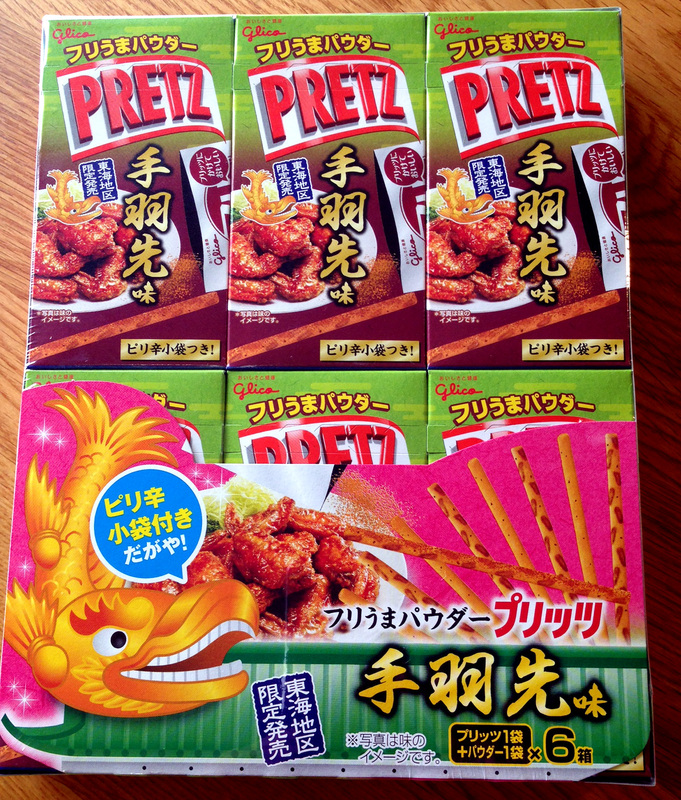 I collected popular ranking Glico’s Local-Limited Pretz!